Moreover, most jobs weren’t breadwinner-caliber. The United States now enjoys the services of 34,000 additional waiters and bartenders. And 22,000 more will ply their trades in “social assistance,” or what passes for it. Salary growth also eased. In a normal world, an underwhelming jobs report might very well frighten the horses. It suggests growth is weak… the way ahead uncertain… and companies pulling in their oars. But when was the last time financial markets could be mentioned in the same day as “normal”? The Dow didn’t slip an inch on Friday’s news. Neither did the S&P. Or the Nasdaq. They’re all flashing green again today. And true enough, Fed funds futures slipped to a 20% chance of a September rate hike after Friday’s report. It was 24% beforehand. Goldman Sachs — here wearing a contrarian’s hat — is actually giving a September hike a 55% chance, if you can believe it. When the Fed took a 25-point baby step last December, the market nearly fell into the blender before Auntie Janet made it clear it was one and done. And if she raises again this month? That means S&P 1,300 without the Fed. Not 2,183, like it is today. Apply it to the Dow and it’s Dow 11,106 — not today’s 18,517. Janet’s been gibbering for months about another hike. 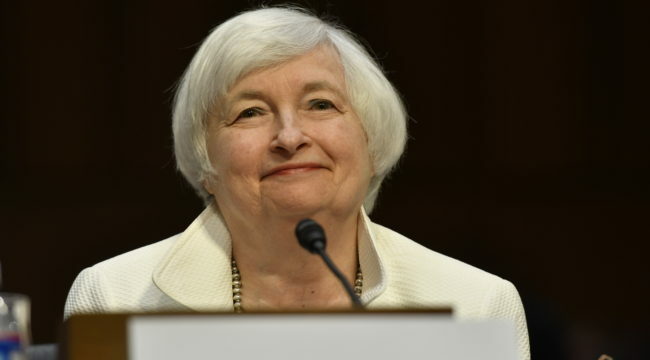 She’s always clearing her skirts with the usual “if conditions continue to improve” and “data-dependent” fimble-famble to justify keeping rates nailed to the floorboards. And this is no typical Republican blank bearing the strong odor of cardboard. It’s Donald Trump. Old Janet would never be invited to another Georgetown dinner party if she helped hand him the election.